Cut each chicken breast in half and place in a large freezer bag. Cover the chicken with your buttermilk, and 1/2 teaspoon of cayenne. Shake the bag to make sure the chicken is completely coated. Refrigerate overnight. In the base of a stand mixer, combine all of your cheese ingredients, and mix on low until combined (about 3 minutes). Transfer to an airtight container. (Cheese will keep for several days). Line a large baking tray with parchment paper, lay out your bacon, and baste both the top and bottom with maple syrup. Bake for 25-30 minutes, turning half way through, until crispy. Drain any excess grease on paper towel and set aside. Heat 3 inches of canola oil in a deep, heavy pot to 350 degrees. In a large bowl, combine flour, garlic powder, sea salt, and 1/4 teaspoon cayenne, and stir together. Working in batches, dredge your chicken in the flour and fry for 7 - 8 minutes, turning several times, until golden brown. 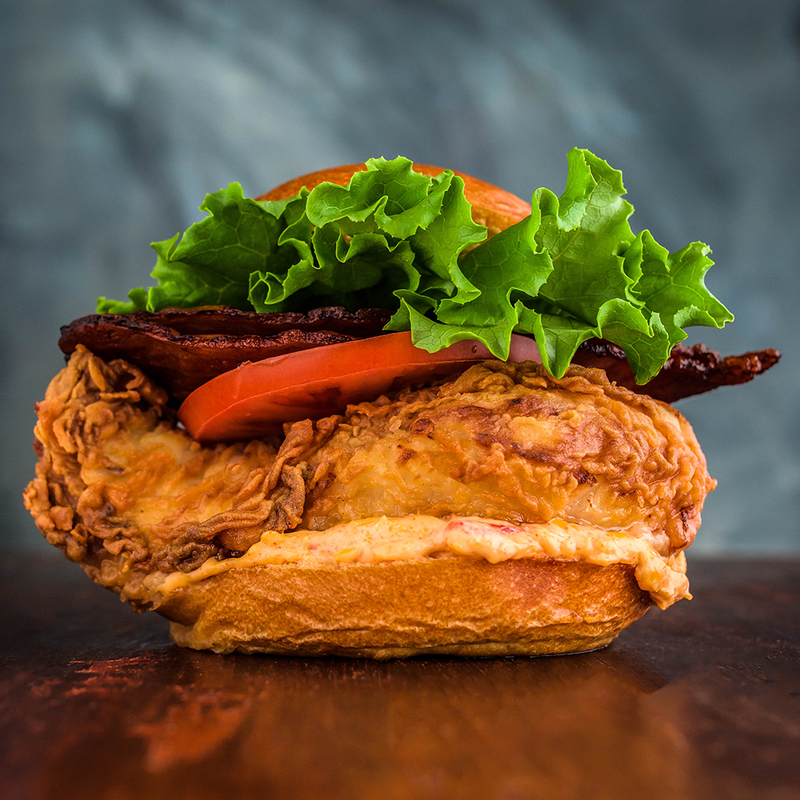 Build your chicken burgers with a tablespoon pimento cheese, one chicken filet, a slice of tomato, 2 slices of bacon, pickles, lettuce, and top with one more tablespoon of cheese.